Because we live in the desert, water is a most precious resource. We must all do our part to use water wisely to ensure an adequate and safe supply for future generations. 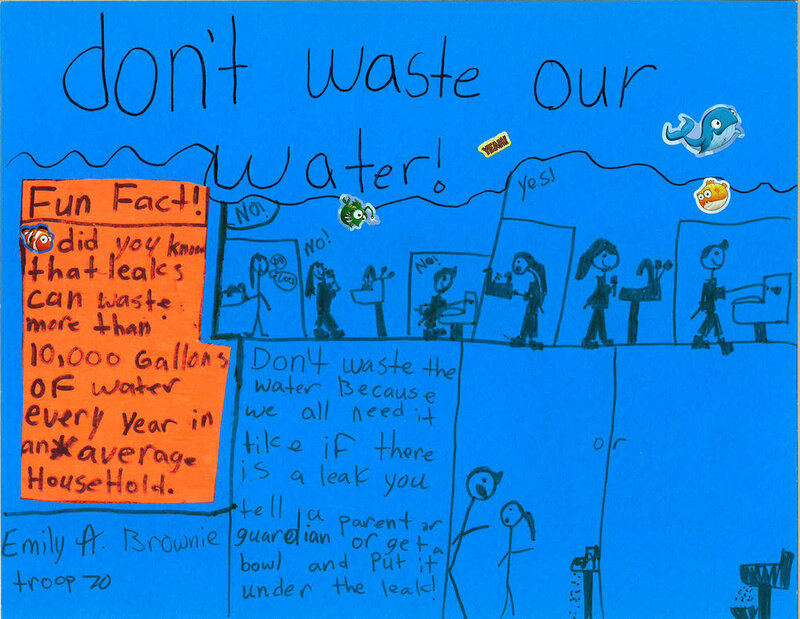 Brownies from troop 70 learned about water conservation and created posters to help us all be wiser in our water usage. Take 5-minute showers instead of baths. A full bathtub requires up to 70 gallons of water. If your shower fills a one-gallon bucket in less than 20 seconds, replace the showerhead with a WaterSense® labeled model, which can save up to 750 gallons of water a year. Turn off the water while you brush your teeth and save up to 4 gallons a minute. That’s up to 200 gallons a week for a family of four. Plug the sink instead of running the water to rinse your razor and save up to 300 gallons a month. Be a leak detective! Check all hoses, connectors, and faucets regularly for leaks. One drip every second adds up to five gallons per day! Check your faucets and showerheads for leaks. Have maintenance personnel regularly check your facilities for leaks, drips and other water waste. We’re more likely to notice leaky faucets indoors, but don’t forget to check outdoor faucets, pipes, and hoses. Designate one glass for your drinking water each day, or refill a water bottle. This will cut down on the number of glasses to wash. Keep a pitcher of drinking water in the refrigerator instead of running the tap. This way, every drop goes down you and not the drain. There are many ways to practice conservation at home. The Marana Water Department web page has helpful tips and links on how to conserve water and save money!